Food blogging is getting more and more difficult. To improve your pictures, you need to understand how your camera is working and how to catch the light. But that’s not all, you need also to build a complete set to beautify the food you just cooked. My passion for cooking brought me to discover photography, food styling, dishes shopping, do it yourself and many more. For this verrine, I sawed an entire pallet to recover wood and sand the old planks to create my table minute. I added as well a wooden box in the background. But you know if I need to build a new set for each picture I will soon not have enough place left in my apartment to store it :)! To realize all my verrine recipe, I also bought plenty of little glasses, where will I store them! 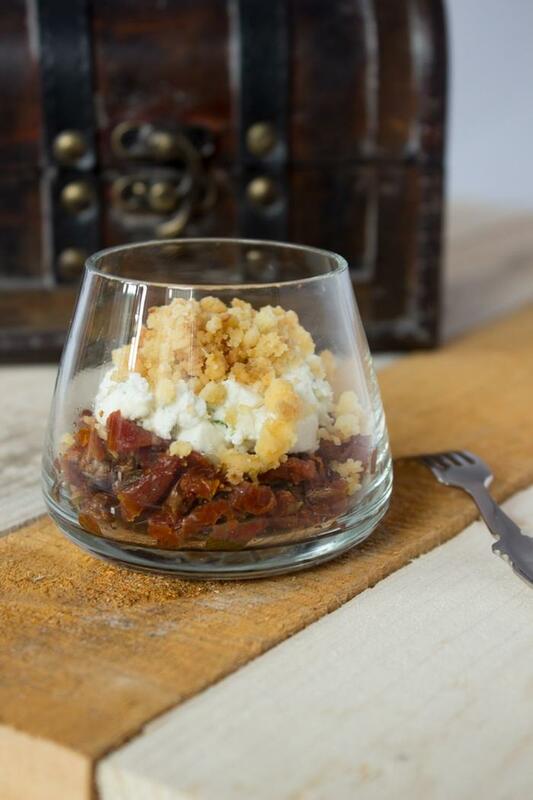 The verrines below associate goat cheese, dried tomatoes and a crumble paste made with parmesan cheese. Delicious! Preheat oven to 200°C (400°F). Dice butter. 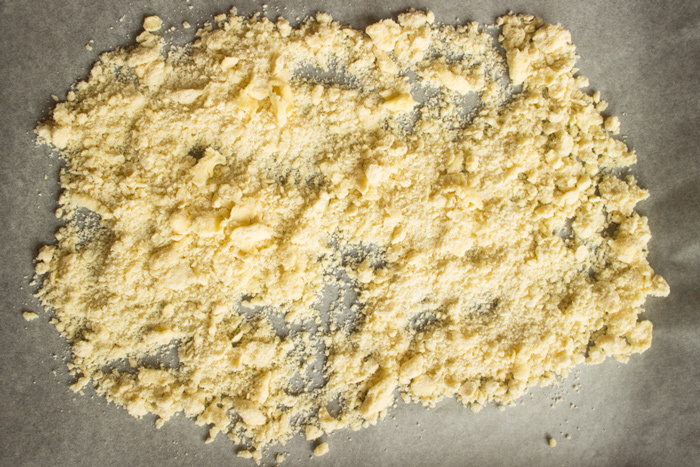 Mix using your fingers with flour and parmesan using your fingers to get your crumble paste. Spread the crumble on a greaseproof paper and bake for 8 minutes. 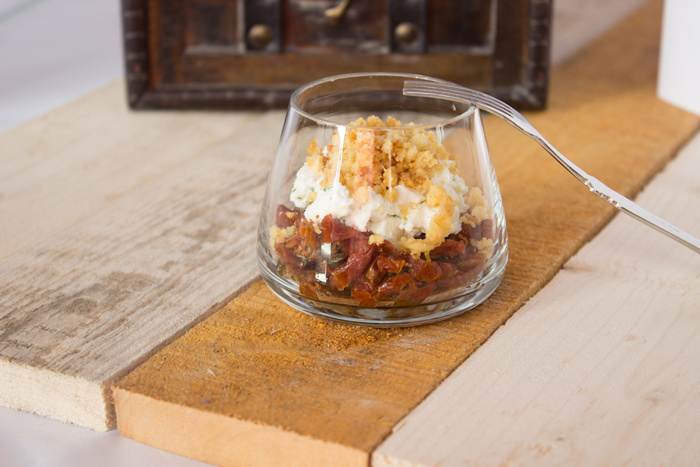 In the meantime dice dried tomatoes and reserve. Mix goat cheese with chives, parsley, salt, pepper, olive oil and pressed garlic. 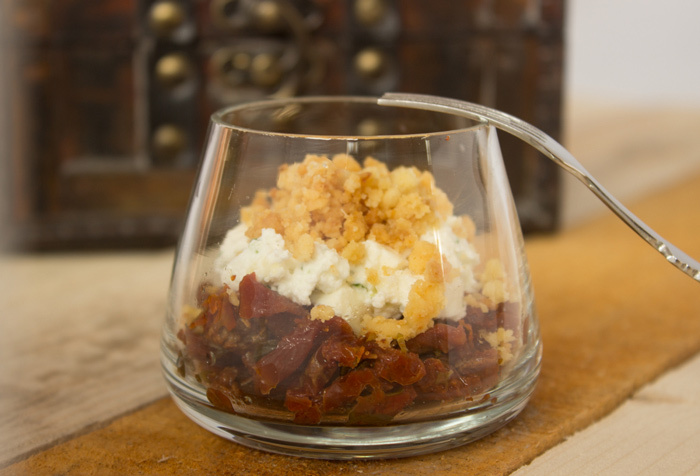 Fill in your verrines with a layer of dried tomatoes, then add a layer of goat cheese and finish by a layer of crumble. I love verrines – super cute and there are so many possibilities for variety. These ones look gorgeous.